All of them or theirs? I have never used Comcast's modem. Mine is capable of speeds well in excess of what they provide. It’s configured in the bootfile they load onto the modem during activation and updates. So whether it’s a rental or a purchased modem they’ll all be overprovisioned. They bought or somehow fund Ookla, so I often suspect their numbers are fudged, probably only while you are checking speed lol. Spectrum and ATT both recommend using OOKLA, but not the generic address- they tell people to add their name at the end. THOSE results are fudged. If you want to use something else, log into your router or try speedof.me to check your speed. I usually retest with other speed test webs just to be sure. And, recently I see the speed jumps to the max and a couple of seconds later it drifts down to half or less. I just tested with this. I don't see an end point it went to. Distance matters. Yesterday one of my tester, testmy.net, went to Australia before I discovered the destination. Of course it was slow, half way around the world. then I found the tab to change destination test station. Yes, didn't see it on the latter; know about the former. 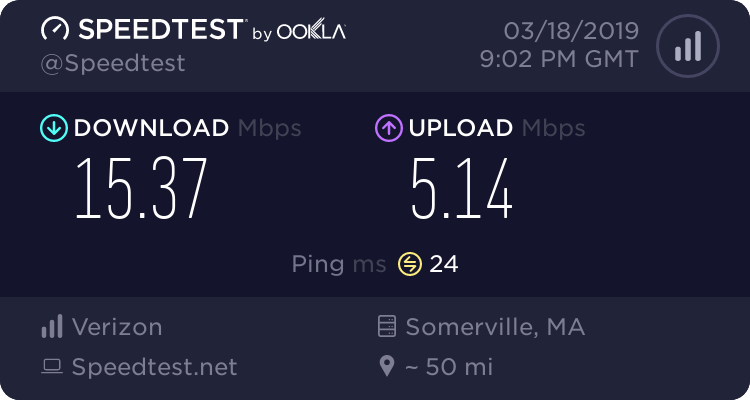 There are a number of test sites, I've used others as well and was able to confirm my speed when I was complaining to them that I was previously not getting the speed I was paying for. (not even close to expected with degradation due to high traffic area). They ended up determining it was an issue on their side (they said I was flagged for a lower speed even though paying for higher). Somehow I think that was BS. It happens. Sometimes the CMTS won’t push a bootfile to a modem until is gotten a firmware update. It doesn’t make a ton of sense but I’ve seen it happen several times. What ends up on the modem is a default “silver” bootfile that’s like 70mbps. Yes, easy excuse on their part, too many of your neighbors are also on line. What BS. My water pressure and volume doesn't change because the neighbors are also using the water. No, the water company has a big enough pipe in the street to handle that and pumps to keep up with the pressure. The ISPs can and should do the same. .... What ends up on the modem is a default “silver” bootfile that’s like 70mbps. But then wouldn't you always get only 70 in that case or less, never more? In that scenario it would top out around there. It was just an example of what can happen. Reading you post after that, the water utility having enough pressure for everyone doesn’t quite fit. There are a lot more variables involved with internet service. More often than not, once any equipment or wiring issues have been fixed at the house, further issues are more likely to be tied to the destination server or the route taken. Not every bit of that is under direct control of the ISP. For example; I used to play an online game with a server based in Montreal. I’m in western Washington. I’d often get a ton of lag, but every time I tested my connection to that server the speeds were great until the packets got to Seattle and left my IPSs backbone. From there the data was handled by another company. Once it got to Montreal it hit another congestion point at the destination itself. Jealous...best I get is 12 down, 1 up...old DSL in the boonies. But what causes congestion points then and why? If it is not the modem or router that lets you max out what you pay for then a test to the same location it is choked. How would a fiber get around the chokes or does it? What happens when you pay for gigabit service, does that too have choke points? Why would that go through why the wired be choked? And, would you still have these issues if you pay for a much higher speeds but not gigabit? Capacity is one choke point but pretty much any decently built HFC or fiber network will be able to handle whatever is thrown at it. After that it’s the capability of the hardware upstream. The ISP itself may have a well maintained system but if the first step after the ISPs network is getting hammered, things will slow down. It all routes up through “bigger and bigger” routers. Then depending on what website or server you’re trying to connect to, there can be another choke point there. Can the server handle all the requests from users at once. Fiber to the premise doesn’t really avoid these issues. HFC is 80-90% fiber anyway. It can help with other things that impact server though. Such as RF signal ingress. When you pay for gigabit service you’re paying for a faster connection to the ISP. It doesn’t change anything in the network. In some cases you might be connecting to a docsis 3.1 carrier instead of a docsis 3.0, but that only changes how the modem is receiving data. Everything else still applies. Thanks. So, I may be only guaranteed to get full speed or close to it to the ISP. But where are they located, say Comcast? Multiple locations? Do they control all the points. What segments do they? Obviously I don't connect directly to an ISP hub, per say. Obviously many/most/all points can handle gigabit traffic as one can clock that close enough so why would a 150 bog anything down? Or is it that there are just way too much traffic out there. Or, do they automatically control my modem? Just having a hard time picturing. With DSL, proximity to a hub is definitely a factor. With cable or fiber not as much. I cant really give any specifics on fiber since I don’t work with fiber to the premise. With cable there are always a few places it doesn’t work as well as it should. Things like old distribution cable direct buried and maybe damaged. Neighborhoods where techs can’t seem to get in to problem houses that are impacting the whole neighborhood, etc. If taking specifically about Comcast, you’re going to be within a few miles of a fiber node that feeds directly to the headend via fiber. As long as your house wiring and service drop are good you should get what you pay for. I’ve only come across a few situations where I couldn’t get full speed, half of them were 1gig and customer equipment related. I missed a few things here. It’s less about what you’re doing with your connection and more about what all the ISPs customers are doing at that time. There’s no way every customer could pull a full speed download at the same time. The system wouldn’t be able to cope with it, but it’s also not a realistic scenario. Its sort of like planning a road system to cope with rush hour traffic, and can most of the time. But every once and a while there’s a major event or just random chance and there’s 30-40% more people on the road. Infrastructure can’t keep up so it takes longer to get everyone through. In those situations, even though the speed limit is 60/70mph you can’t go that fast even though your car is capable. If capacity is a consistent issue the ISP will expand it. The most common problem area is upstream. Downstream in my area has 16 6mhz bonded channels or a 90mhz wide OFDM carrier to deliver its speeds. Upstream only has 4 6mhz bonded carriers to deliver its speed and they’re pretty close to the FM band and easily interferes with by noise on the line. That’s where the conversation shifts from overall speeds to reliability though. Upstream issues are more likely to cause stability issues. I'm told by a competing fiber provider that with FTTN, the distance to the node has to be about 500-600 yards. Further than that, the performance drops like a stone. FTTH seems to be a different game. My daughters house easily sees sustained gigabit speeds any time of the day or night. Very high upload speeds as well. The future is definitely fiber. I’d agree with those distances if it were an entirely passive network after the node, which is the next step here. But with an active network that distance can be quite a lot further. There is definitely a bandwidth advantage with FTTP within the ISPs network, especially in the upstream. It’ll still be subject to the same congestion issues on the internet at large as any other type of connection. It might be a different story if any individual ISP owned and maintained every bit of the network from the demarc on the house to the destination server. That just isn’t the case.